We’re going to talk about the different exam categories of grade 3 piano: piece categories, the technique that’s required, as well as ear and sight tests. Linked below is a copy of the online syllabus which is free to use and has all this but in more detail. Grade 3 piano generally corresponds with your fifth year of piano as a kid (oftentimes the start of the third year of piano as an adult, depending on how hard you work). Preparatory, Grade 1 and grade 2 piano are all about the beginner stages. You learn how to read notes and rhythms with increasing complexity. Once you finish this level, you should be comfortable with most notes on the staff, interval identification should be quick, and you should be reasonably skilled with the most common rhythms. In grade 1 and 2, you start developing hand independence and style – like the ability to pull off louds and softs in an emotive way, or play staccatos and accents. So once that’s out of the way, we hit grade 3, which is the first intermediate level. Grade 3 is considered “early intermediate”, and everything between levels 3-6 is considered intermediate. Once you hit Grade 7, that’s when things start getting advanced. Basically, by Grade 3, you should be comfortable with all the basics. So in Grade 3 piano, instead of drilling rhythms and note reading, we get to start spending more time on theory, history, and interpretation. Grade 3 RCM and Grade 3 ABRSM are roughly equivalent in difficulty, which is why I’m doing a combined video of the two. For Grade 3 RCM exams, you need to prepare 5 pieces: 2 etudes (studies), and 3 repertoire pieces. For Grade 3 ABRSM exams, you need to prepare 3 repertoire pieces. List A pieces in the RCM are Baroque dances. You’ve got a bunch of minuets, as well as other dance styles such as a gavotte, bourree and musette. 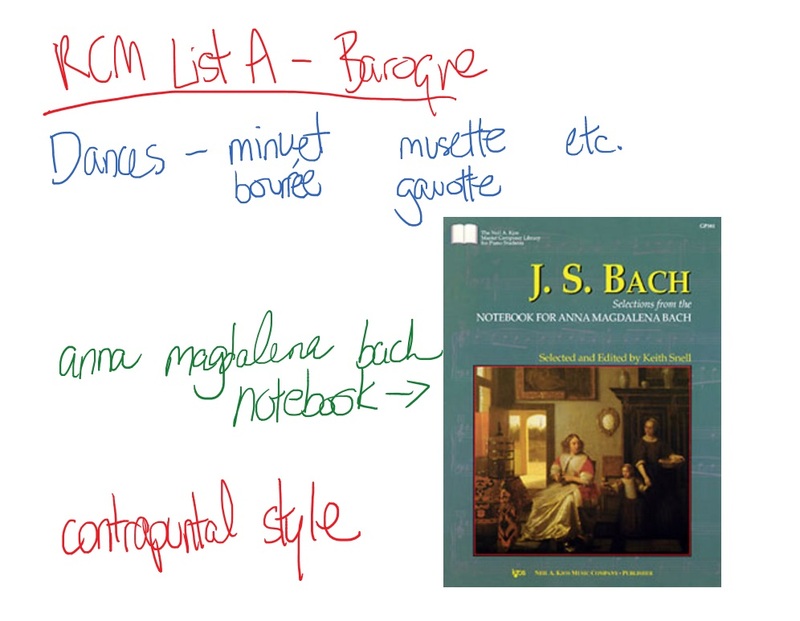 This is the perfect time to pick up the Notebook for Anna Magdalena Bach, as most of the pieces start at a grade 3 level and get progressively more challenging. These dances are written in contrapuntal style (mainly in 2 voices), which means they’re great studies for hand independence. Contrapuntal simply means that there’s two independent melody lines played at once. 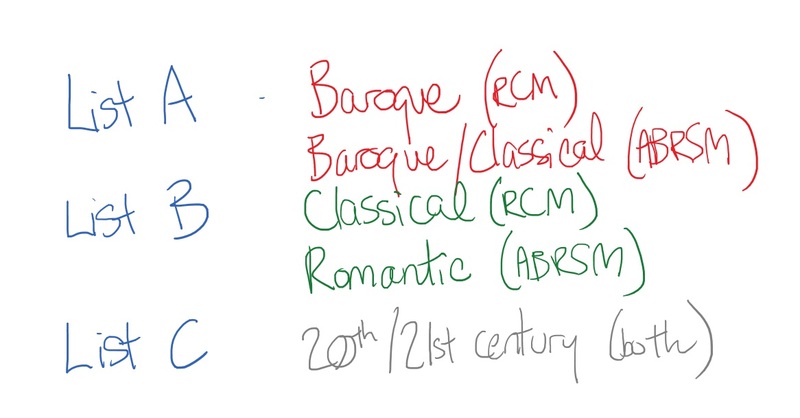 In the ABRSM, List A merges both the Classical and Baroque eras. You’ve got some dances by Haydn, CPE Bach and Scarlatti, but you’ll also see a Clementi sonatina, which we’ll discuss in just a moment. In the RCM, this means Classical and Classical-style repertoire. This is the first grade the RCM splits Baroque and Classical into two separate categories. 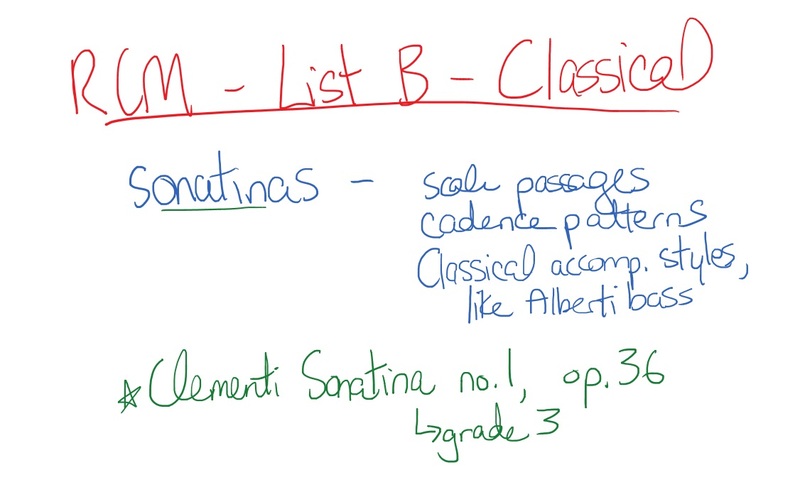 There are a few different styles of pieces in this category, but it includes the main feature of grade 3 piano – the sonatina. Starting in Grade 3 we can begin to study Clementi’s very famous op. 36 sonatinas (namely the first one). This is a big project, but it’s really rewarding. When I was learning piano, I was always frustrated by the challenges of Classical-era music like sonatas and sonatinas. They would be the pieces I procrastinated on. But once I was able to play them, I often found them to be the most fun. They have a ton of variety, and they’re often really fast. They take a while to perfect, but they end up being great “show-off” pieces. The ABRSM’s list B choices are a little different. Since the List A encompassed Baroque and Classical eras, the list B is Romantic-era music (19th Century). Romantic-era music is generally very well-loved because of its expressiveness and evocative titles (Witches’ Dance, as opposed to Sonatina in C). It’s in this category, you’ll come across modern genres like jazz and blues. You’ll find mood pieces and character pieces. This is the category for Christopher Norton, Martha Mier and Mike Schoenmehl, who are some of my favorite modern composers. RCM requires a fourth and fifth piece to be learned, called studies or etudes. These are songs designed around a specific technical concept, like light staccatos, working with fifths, chromatic scales, and stuff like that. They can be old or new, quirky-sounding or more traditionally song-like. You’ll encounter composers from Czerny to Bartok, to modern composers like Norton and Donkin. The fifth, and optional, category in grade 2 piano is pop pieces. I don’t like to omit this category! There’s a pop syllabus for the RCM as well, which I’ll link to here. Basically, if you do an exam, you have the option of substituting a pop song for the study. You can play a pop song that is either at your grade level, or the grade immediately higher (so grade 3 or 4). You might think, oh it’s a pop song like “Let it Be”, therefore it must be easier to play than these other pieces. It depends. Some of these pop songs actually have very complex rhythms, and are almost always longer (2-3 pages as opposed to 1). But at the same time, they’re very fun to learn. First, let’s talk technique. In the RCM, grade 3 is the first grade you’re expected to do 2-octave hands together scales, which is a bit of a learning curve. Aside from new scales, triads and formula patterns in different keys, the only other main addition to RCM technique in grade 3 is 2-octave triads (instead of 1 octave in grade 1 and 2). In the ABRSM, you need to be able to play your scales hands together and separately, the same as grade 2. The only other change is that there are now some hands together arpeggios. Sight reading involves reading a song fragment on the piano, off the cuff. The RCM sight reading for this level is quite a bit easier than the ABRSM – it’s only a four-measure passage, and in simple and familiar keys like C and G major. In the ABRSM, the sheet music might be up to eight measures, and in slightly more unusual keys like Bb and Eb major. In the RCM, you have an additional sight reading hurdle – reading/clapping a rhythm while tapping a steady beat with your hand or foot. Then we have the ear tests. In the RCM, you have to listen to the examiner play something and clap back the rhythm and identify interval distances. You have to discern the difference between major and minor chords while also being able to identify specific notes in the chord such as root, third and fifth. And finally, you’ll have to “play back” a short little ditty that the examiner plays (they’re short and 1-handed). For the ABRSM, you’ll also have to clap back a tune, in addition to a “sing-back”, where you echo the tune the examiner plays. She’ll also play something twice that has a slight pitch change the second time, and you’ll need to pinpoint where that pitch change was. You’ll also need to be able to do a listening analysis, where she plays a short piece and asks you questions on things like the dynamics. Finally, let’s talk percentages, starting with RCM. 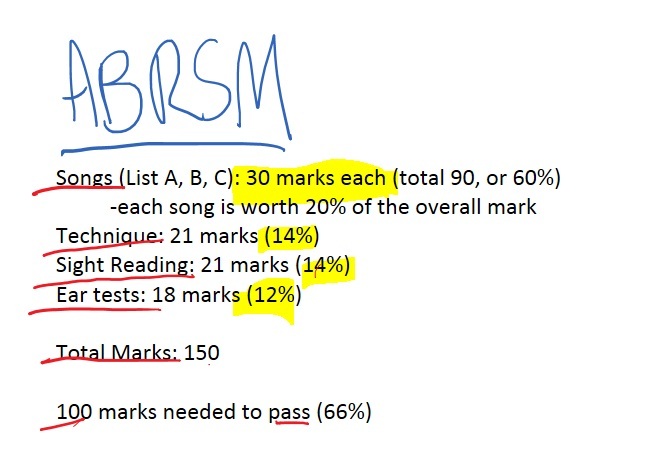 Now let’s look at the percentages for ABRSM. In the syllabus, there’s a big song list of all the pieces you can play at a grade 3 level, in each category (List A, List B, and so on). Definitely check that out – if you like, you can buy the grade 3 RCM/ABRSM books, as they have a good, diverse collection of the pieces and then there’s no guesswork involved – you know the pieces are all going to be at the right level. Another route is to get books that include these grade 3 pieces – these books often have songs at a variety of levels, not just grade 3. This is a good route to take if you want to have a more interesting piano book collection, or if you want to diversify beyond the pieces provided in the Grade 3 books. In the near future, I’ll talk about my favorite grade 3 level books and why, so stay tuned for that. 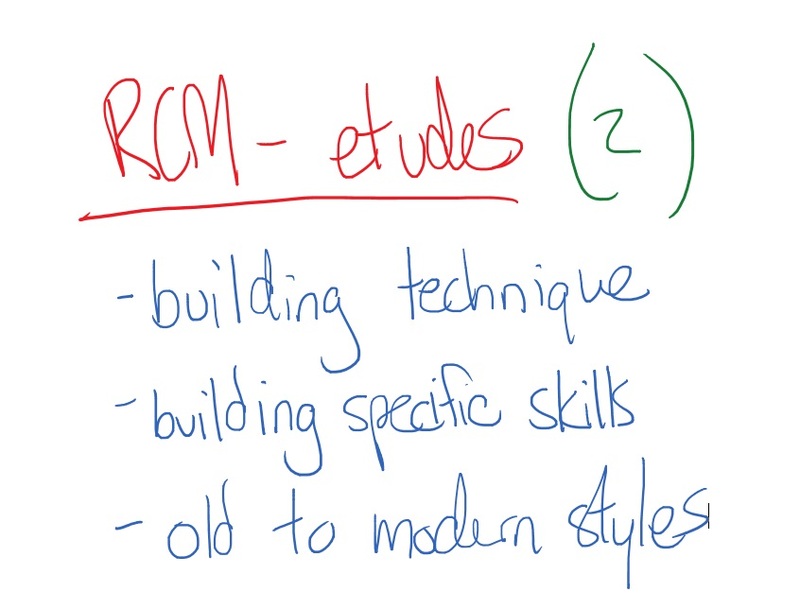 Hopefully this has provided you with some general information about Grade 3 piano through the RCM and ABRSM – in following videos we’ll also discuss what to expect from an examination if you decide to go that route, as well as good books that I mentioned above. If you have any questions about grade 3 piano, or things you’d like to see me discuss in a video, please leave a comment below! I always love your feedback, and want to help you out as much as I can. 2015 Edition. Composed by The Royal Conservatory Music Development Program. This edition: 2015 edition. Celebration Series. Baroque, Classical, Romantic, 20th century and 21st century. Method book & online audio. 40 pages. Published by The Frederick Harris Music Company (FH.C5R03). 2015 Edition. Composed by The Royal Conservatory Music Development Program. This edition: 2015 edition. Celebration Series. Method book & online audio. 20 pages. Published by The Frederick Harris Music Company (FH.C5S03). 2015 Edition. Composed by The Royal Conservatory Music Development Program. This edition: 2015 edition. Technique. Technical Requirements for Piano. Book. 15 pages. Published by The Frederick Harris Music Company (FH.TRP03). Composed by Boris Berlin and Andrew Markow. Edited by Laura Beauchamp-Williamson. This edition: 2015 edition. Ear Training. Four Star Sight Reading and Ear Tests. Book and online audio. 48 pages. Published by The Frederick Harris Music Company (FH.4S03).